The measure of diversification that determines how closely a particular fund's performance parallels an appropriate market benchmark over a period. The market is understood to have an R Squared of 100%. Therefore, a fund with an R Squared of 95% contains 95% of the market's diversification and risk. The remaining 5% is unique to the fund manager's actions. The distance between the high price and the low price for a given time period. For example, the daily range is equal to the day's high minus the same day's low. A momentum oscillator that measures the percent change in price from one period to the next. The plot forms an oscillator that fluctuates above and below the zero line as the rate-of-change moves from positive to negative. The oscillator can be used as any other momentum oscillator by looking for higher lows, lower highs, positive/negative divergences and crosses above or below zero for signals. See our ChartSchool article on Rate of Change. The use of a ratio to compare the relative strength between any two entities. For example, an individual stock divided by the S&P 500 Index can determine whether that stock is outperforming or underperforming the stock market as a whole. A rising ratio indicates that the numerator in the ratio is outperforming the denominator. Trend analysis can be applied to the ratio line itself to determine important turning points. An intermittent peak that forms as a security fluctuates. Whether a security is trending up, trending down or moving sideways, intermittent peaks and troughs form due to changes in supply and demand. Defining reaction highs usually depends on the minimum criteria set for time intervals and price movements. An intermittent trough that forms as a security fluctuates. Whether a security is trending up, trending down or moving sideways, intermittent peaks and troughs form due to changes in supply and demand. Defining reaction lows usually depends on the minimum criteria set for time intervals and price movements. After a decline, an advance that does not surpass the high from which the decline began is known as a reaction rally. A reaction rally, also referred to as a retracement, typically retraces from 1/3 to 2/3 of the previous decline. A breadth indicator that is the 10-day SMA of the High-Low Index. 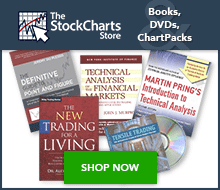 See our ChartSchool articles on Record High Percent and the High-Low Index for details. A continuation chart pattern where prices move sideways between two different levels for a period of time and then continue moving in the direction of the previous trend. See our ChartSchool article on Rectangles. See Price Relative in the glossary or ChartSchool article on Price Relative. A popular oscillator developed by Welles Wilder, Jr. and described in his 1978 book New Concepts in Technical Trading Systems. RSI is plotted on a vertical scale from 0 to 100. Values above 70 are considered overbought and values below 30, oversold. When prices are over 70 or below 30 and diverge from price action, a warning is given of a possible trend reversal. See our ChartSchool article on Relative Strength Index. Resistance is a price level at which there is a large enough supply of a stock available to cause a halt in an upward trend and turn the trend down. Resistance levels indicate the price at which most investors feel that prices will move lower. See our ChartSchool article on Support and Resistance. A decline that retraces a portion of a previous advance, or an advance that retraces a portion of a previous decline. Retracements typically cover 1/3 to 2/3 of the previous move; a retracement of more than 2/3 typically signals a trend reversal. In Point & Figure charts, the reversal amount is the number of boxes required to be retraced to cause a reversal and, thus, a move to the next column and opposite direction. When a smaller reversal amount is set for the same data, reversals will be more frequent and longer-term price trends will be more difficult to identify. Increasing the reversal amount removes columns corresponding to less significant trends. A chart pattern that occurs before an existing trend reverses direction. For example, a Head and Shoulders reversal pattern marks a change in trend. A break below neckline support indicates that the H&S pattern is complete and the prior uptrend has reversed. For more reversal patterns, see the ChartSchool section on Chart Patterns. Market turns that happen very quickly with little or no transition period. Spikes often occur when a market has become very overextended in one direction, when a sudden piece of adverse news causes a sudden reversal. Reversal spike highs (aka blowoffs) and lows (aka selling climaxes) can signal a reversal or deceleration of a trend, but unfortunately they are very difficult to forecast. A stock split which reduces the number of outstanding shares and increases the per-share price proportionately. A calculation equal to the potential reward divided by the potential risk of a position. A long position entered at 100 with potential reward estimated at 120 and potential risk of 90 would have a reward-to-risk ratio of 20:10, or 2 to 1. Generally, a higher reward-to-risk ratio is a more appealing trade. For a long position, potential reward might be based on breakout projections, resistance levels or retracement estimates. Potential risk might be based on support levels, stop or loss requirements. A bullish continuation pattern. A long white (hollow) body is followed by three small body days, each fully contained within the range of the high and low of the first day. The fifth day closes at a new high. A bearish pattern that begins wide at the bottom and contracts as prices move higher toward a support break. See our ChartSchool article on Rising Wedge (Reversal). Also known as a saucer bottom, it is a reversal chart pattern representing a long consolidation period that turns from a bearish bias to a bullish bias. See our ChartSchool article on Rounding Bottom (Reversal). A price gap that usually occurs around the middle point of an important market trend. For that reason, it is also called a measuring or continuation gap. The Russell 2000 ($RUT) tracks 2000 smaller companies. Chart $RUT in GalleryView.